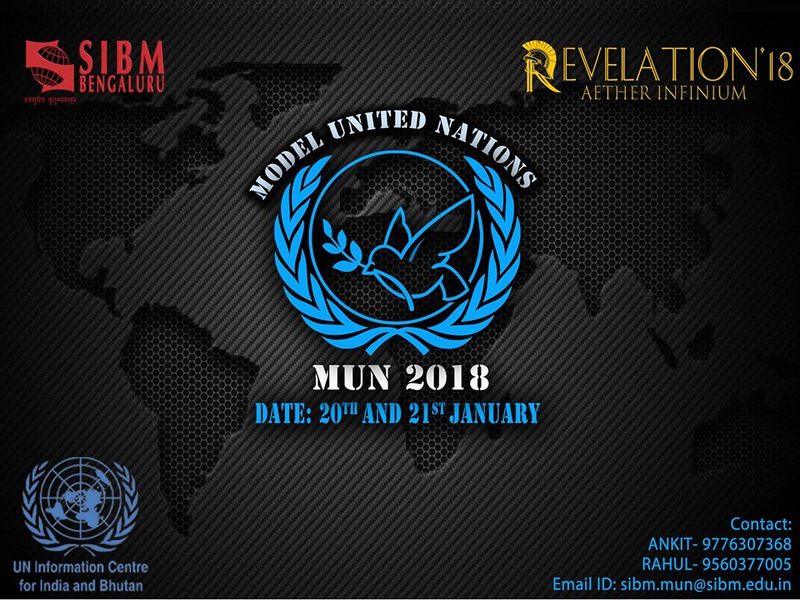 Symbiosis Institute of Business Management (SIBM) Bengaluru is all set to organize the third edition of Model United Nations on the 20th and 21st of January, 2018. It is an academic simulation of the United Nations that aims to educate the participants about current event topics in International Relations diplomacy. The General Assembly will talk about the role U.N. in promoting new global human order. The Security Council will be discussing the Yemen Civil War and the role of religious rebel groups having different stakes. The Human Rights Council will be evaluating potential human rights infringements by technological advancements in fields like Artificial Intelligence. The Continuous Crisis Council agenda will be disclosed on the day itself. The delegates get a chance to gain insight into the workings of the United Nations and the dynamics of international relations by assuming the roles of UN representatives, members of other international bodies and national cabinets. It is an exciting opportunity for students to debate on issues that confront world leaders and to draft resolutions in response to these global issues. The participant, the executive panel considers being the most contributing is given the ‘Best Delegate Award’. Date: 20th and 21st January, 2018.